Puppies are born without teeth. The puppy dental development model is similar to that of humans, the difference being that dental development in puppies is faster. First appear the milk or deciduous teeth, the development of which is completed at the age of 6 weeks. At their final development stage, puppies have 28 deciduous teeth but contrary to adult dogs do not have molars. Milk teeth are replaced by permanent teeth starting at the age of 3 months, when milk teeth drop and permanent incisors start to grow out. Dog dental development reaches its final form at the age of 6-7 months. At that stage the dog has 42 teeth (12 incisors, 4 canines, 16 premolars and 10 molars). During the period of teeth shedding, it is not at all surprising for owners to find dog teeth around the place, or to note gum bleeding, which in healthy puppies stops on its own without requiring any special care. At this stage the owner will be alarmed by heavy bleeding (for example, in animals with hereditary disorders of the haemostatic mechanism), and the appearance of permanent teeth without the puppy shedding the deciduous teeth. 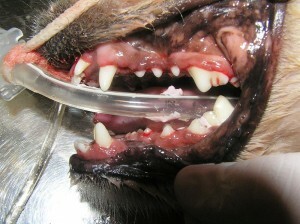 The oral cavity of puppies should be checked regularly to early detect any conditions. Because puppies visit the vet often such problems are detected during standard clinical examination. Dogs are living longer today because of advances in veterinary medicine and improved care by their owners. Therefore, dental care is particularly important, ensuring healthy teeth for your dog until its old days. Further, serious dental and periodontal diseases pave the way for attacks by other systemic diseases such as glomerulonephritis, bacterial endocarditis, etc. It is common for serious dental problems to be detected by the vet as incidental findings during a routine visit (Figure). 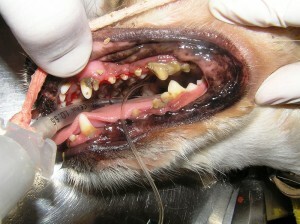 In many cases the problem is at such an advanced stage that the vet has to remove many of the animal’s teeth. Common teeth problems in animals are not that much different from those of humans, including gingivitis, dental tartar and bad breath, abscesses and root canal fistula, periodontal disease, etc. When the problem is severe, tooth cleaning is recommended at the vet’s. The result (see photo) will certainly be a healthier and cleaner mouth. Special toothpastes and brushes are available on the market for use in animals. Avoid using toothpastes for humans as these are intended to be washed off after use (which is particularly difficult for a dog to do), while veterinary toothpastes do not require washing off. The earlier dental care starts the easier it will be for the animal to accept it and the less dental conditions will appear. Ask your vet to show you how to care for your animal’s oral health.